And speaking of the following day... July 27... that day is gonna be a whopper. July 25 marks my anniversary of doing this blog for two years. My birthday is the same week... so to celebrate... there will be a week of giveaways, reviews, special posts.... maybe even surprise guests... you won't want to miss it. Plus, I am going to spend the next few weeks culling my books again and posting them in the Etsy shop... and then come Monday the 27th... whatever is left will all go on sale for half price for a whole week. Seriously, I'm gonna be giving stuff away in there. I've got two 3yo bird-fanatics-in-training here: looks like a fun read! Would love a copy of this for our library. When my five year old daughter was really little, her favorite thing to ask was "tell me something bluejay, mommy?" and today her almost-two year old brother finally noticed the bluejays on our patio. This book would be very popular in our household! I'd love to have this book. Michael Frith is a fun illustrator (Because a Little Bug Went Ka-Choo! ), and writer (I'll Teach My Dog 100 Words). It will be pretty interesting to see him do realistic illustrations. Thank you for putting this one up! We are burgeoning birders. My little guy would love this book. We cannot get our hands on enough bird books...looks like a good one! I would love to get my hands on this for my friend who is an avid birder! Looks like a good one! oh i just found your blog a couple weeks ago and am quite smitten with it!!! we love all things vintage & nature so this would be perfect! thanks for posting a give-away! Looks like a spectacularly interesting book!! Hope I win!! Have a great day! Made it back to your blog after a hiatus and it's still great! Would love to win! Looks like a great book. My son would love it! A birthday and a blog anniversary - hope you dig into a an especially tall, mouth-watering dessert. Looks like a great book to add to our collection. thanks for offering this giveaway. I hope you have a great birthday week! Would love that book for my daughter! 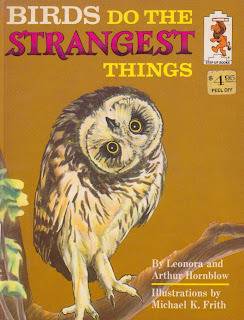 My nephew is fascinated by owls - he'd love this book for the cover alone! He'll read it, too! Thanks for the chance! oh, birds! I would love a copy. Thank you! throwing my name into the hat! this looks terrific. we love birds and I would love to have a copy of this. I would love a copy of the book for my bird loving son.